So here we are, at the end. 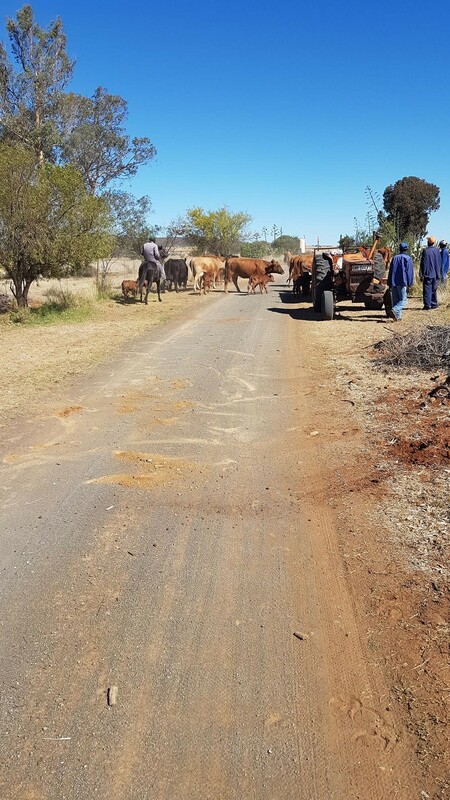 I’m wondering how many other riders around me are hoping this is purely figurative – that this isn’t some literal ‘end’ that will see us perish in the jaws of that Karoo Beast we contemplated with Hendrik. As the clock winds down, the reality of exactly where we are settles in and the nerves suddenly vanish. For me, this is the culmination of months of planning and dreaming, for T it’s more like years – he’s had his heart set on this ride almost since it first began. For Nico, nearby, I’m not sure he really new he was going to be doing this until a few weeks back. After his successful TCR attempt, I think the chance to complete both in the same year was just to great to resist. And just like that, its time. 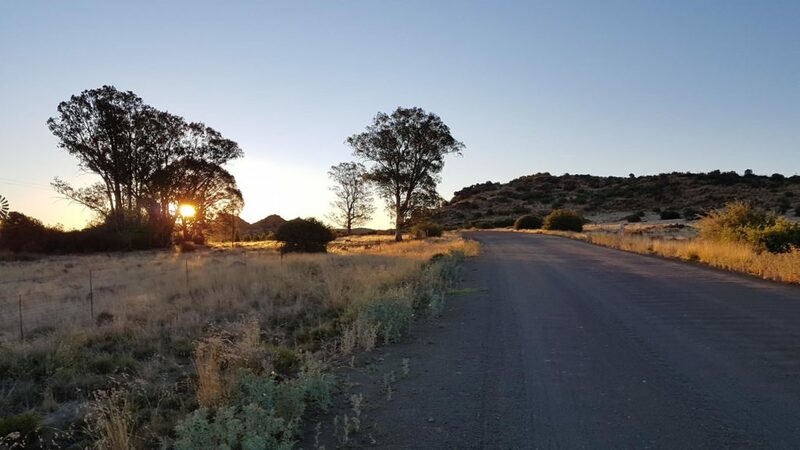 But right now, for all of us, this is it, this is our Munga – no more hiding from the heat in the shade, it’s time to embrace the full glare of the Free State sun. A buzzing wave of drones float on the breeze directly overhead as we mount up and slowly roll forward in formation under the banner. I wonder if any of the footage will show a clearly recognisable image of T or I as the mass weaves through the car park (none has come to light as of writing this). They’re not kidding about this being an offroad ride. We’ve barely passed through the exit barriers than a sharp left takes us onto a litter strewn, hard packed mud track that wends it’s way out of the city and onto a mix of district gravel roads and farm trails. It takes a few kilometres before T and I manage to join up again after the inevitable split caused by the mass start. Both of us have successfully navigated the broken bottles, ruts, rocks, kerbs and holes of the opening stretch, but a rather bigger problem has now come to light. The test rides T has done with his rig weren’t fully loaded. Now, on heavily corrugated and rutted trails, each time the rear suspension of his Specialized Epic bottoms out it causes his bulging saddle pack to rub alarmingly against the rear tyre. We pull over and T attempts to stiffen his shock to lessen the contact, but there’s still a worrying screech with every dip in the path. It’s clearly going to need some attention to avoid damage to either his bag or tyre. 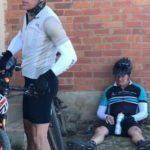 Being the naturally slower rider, I suggest that T push on ahead and build up a buffer to give some time to fix it at one of the two waterpoints (WP1, WP2) or the Race Village (RV1 – Van der Kloof Dam). He hooks onto one of the tail groups and is soon lost from view ahead. 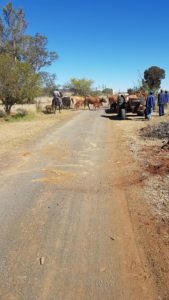 The time spent fiddling with the saddle has placed me right at the back of the field – in fact at one stage there’s an ER24 vehicle right behind me and as I ride along in their company it strikes that I may even be dead last. It’s a thought which brings a smile to my face – over the last few days I’d mentioned to both Yoli and the guys at William’s Bike Shop that if they see my dot in last place, they shouldn’t worry. It’s actually a good sign that I’m pacing my ride. I wonder if any of them are watching my dot at this moment with those words in their heads. There are plenty of other reasons to smile too – it’s an absolutely glorious afternoon, it’s not too hot, and we’re out on our bikes surrounded by a vast golden swathe of countryside embarking on an enormous, impossible, adventure. I alternate places a few times with a rider whose bike I recognise – we’d exchanged a few brief words earlier in the day about his Jones H bar (a proper bike packing classic although not common on South African rigs). One of the early farmhouses we pass through has a friendly and enthusiastic family of supporters outside – tables loaded with coke and iced water. It’s not an official stop, but it’s open to all and I’m certainly not going to pass up the opportunity. My energy levels are feeling on the low side, so anything to help is welcomed. It’s a smooth, relatively fast and uneventful run to the turn into WP1. A breeze propels me rapidly along the short driveway that leads to the farmhouse lawn, strewn with bikes and bodies, and a bountiful array of drinks and foods is spread out on tables at the back. In some order, I down at least two cups of coffee, a coke or two, a boerie roll, and possibly some other items that I’ve forgotten. I also need the loo, although it’s more than a little embarrassing to lug my already dirty body through the smart and tidy house and into a pristine toilet with quaint nic-nacs, and country style decorations of all kinds. I do my best to leave it in the tidy state I find it, but a raised eyebrow from a rider I pass in the hall suggests he is nervous to follow in there after me. Or perhaps he’s just as nervous as I am about what evils he may end up leaving behind. It’s one thing defiling a Portaloo, but this is someone’s home. Rolling out from the WP I am briefly held up by what I presume passes for traffic in the Free State. A group of guys on horseback are shooing an obstinate herd of cattle down the driveway. One calf has taken refuge under a trailer and has to be dragged out, protesting. 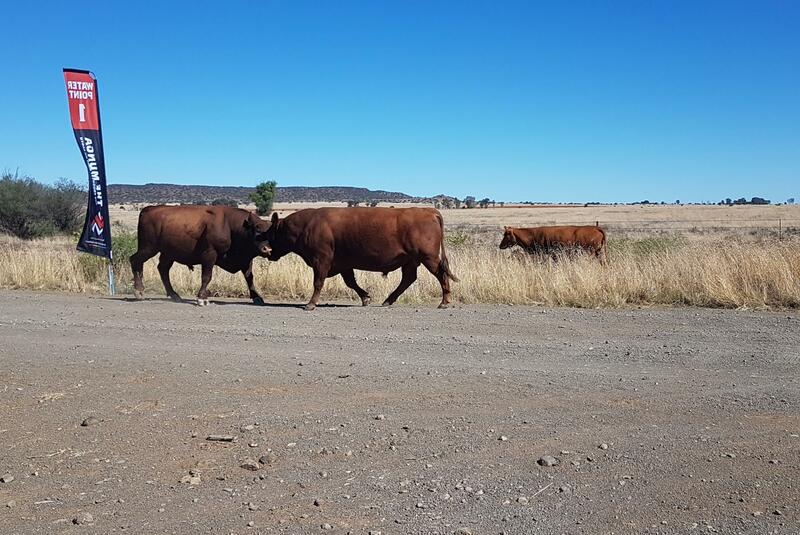 Two bulls are engaged in a full on battle – butting heads and charging each other all the way down the driveway, and continuing out onto the gravel road. I should have switched my phone into video mode because the photos don’t really capture the ferocity of their struggle for dominance. As the afternoon sun gradually dips lower it colours the vast expanse of grassland either side of the road in deep, rich golden hues. The temperature isn’t really dropping, but the heat is manageable – the strong breeze and the speed it helps me achieve pushes a welcome flow of steady, cooling air over me. Here and there are other riders, some in small groups. But once out of sight of the waterpoint I doubt I see more than 15 or so other riders the whole afternoon. We’re a handful really, out here enjoying the glorious, never ending horizons of Free State veld. Up ahead, where the route joins a gravel road I see a school bus slow and stop. By the time I reach the junction it’s gone, but the handful of excited school kids it disgorges are running and jumping along the edge of the road – some of them come and slap my outstretched hand, shouting out as they do so. A brief moment of contact with normal life as we roll along district roads for a while. I’m generally very happy to ride alone, but an unexpected event leads to some riding company which proves very welcome. As I settle into a steady cadence down a long straight stretch of pleasantly smooth gravel I pass a couple of riders who are stopped – one is the chap with the Jones H bar. Uttering my usual “you guys OK” I’m about to press on when their reply stops me dead. “Are we on the right track?” one of the guys calls out. I glance down. No, we’re not. The Garmin eTrex is showing a thin green line – the track of where we have ridden. The thick purple line showing the track we are meant to be on is missing. Bugger! Already a navigation mistake, but as the screen re-orientates itself I can see we’ve only missed the turn by a hundred meters or so. Just back along the road is a farm gate we’ve all missed. “There, that gate back there I think is where we were meant to turn”, I reply. We’re not the only ones to have gone wrong, a bit further along the gravel two other riders spin around as they see as turn and backtrack. The section immediately after the gated turn is a mix – occasionally it’s an easy twee spore (two track) trail with light gravel and sand, But at times it is rutted and bumpy, making for slow and uncomfortable progress. We swap names along this section and discuss the possibility of riding together as night approaches. Pieter is the chap with the Jones H bar. He’s battling an infection and is intentionally pacing himself to conserve energy. Andrew is the other rider. He, like me, is content to ride easy to avoid burning too many matches too soon. We stay in proximity to each other along the next sections – although not always together. On a couple of occasions I find myself ahead. The Giant XTC hardtail is light and fast across the rolling gravel roads, and I’m not really concious of putting in much effort for the speed I’m travelling. Up ahead somewhere around the 96km mark is the Steunmekaar Spaza – a recommended stop given the long the distance to WP2. We’re back riding as a group as we roll up to the little shop – but I’m seriously doubting whether I’ll be able to stick with the guys much beyond this. My tanks feel absolutely empty of anything like energy, and I’ve no hunger to eat either. I grab Coke, a Poweraid, and some chocolate bars inside the shop and trudge outside to sit and try and gather myself. I leave a message for Yoli – or maybe we spoke, I forget exactly. Either way, her words were typically practical and encouraging: “hang in there“, “just keep going, you’ll recover along the way“. I know she’s right. The first part of every long ride is always my worst – it often takes a while for my stomach to settle down to digesting food properly to give me energy. I opt for a medicinal boost too, just in case some hidden bug is also lurking – downing an Advil and a Rennie tablet with the colourful cocktail of sodas. Pieter is sat on the step next to me, although conversation is sparse – neither of us are feeling on top form. Later on someone posts a photo of T crashed out at this exact same spot – ahead of me at the time it was taken, but looking just as wrecked. “I’m gonna roll out slowly, you guys will catch me on the road I’m sure”, I say as the last of the bottles is emptied and bars are finished. It turns out to be quite a bit further down the road before we join up again. The gravel road rises steadily into the last rays of a sublime sunset and once crested, a long fast gradual downhill follows. At times it’s scary, the rays of the low sun now directly ahead are blinding. It’s impossible to see any real detail more than a few meters ahead, meaning every small hazard needs lightening fast reactions to be avoided. Eventually, the road flattens and the sun dips fully behind the line of hills and the road is now lit only by the beam of my own light. 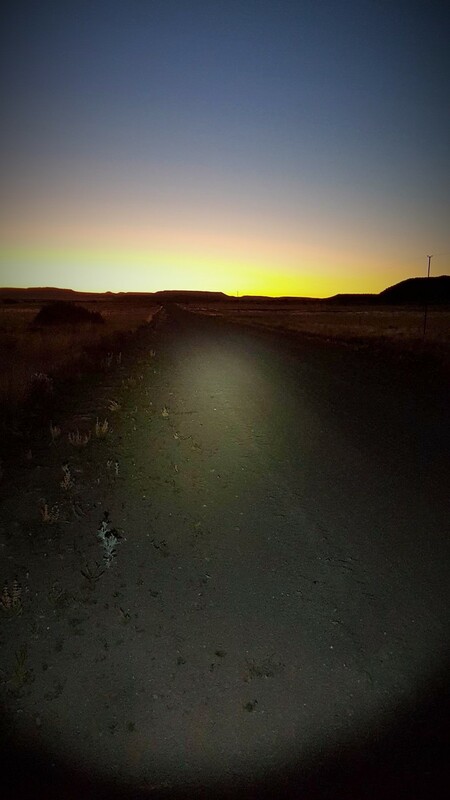 I see Pieter and Andrew’s lights tracking me behind, but the fast pace of the downhill has prevented them from quite closing the gap. As night falls completely, the route turns left and I back off to a slow pedal until they catch up – it’s pretty unlikely they’d take a wrong turn here, but it feels like the right thing to do. Plus night riding is considerably more enjoyable and safer in company. Shortly after we join up we roll up onto the familiar iron girded Riet Rivier bridge. Of the many race photos I have seen of this landmark, none have been in the dark. It’s yet another reminder that the majority of the field have passed through this point long ago. Spinning onwards towards a horizon now lit up with stars, it doesn’t seem to matter one iota. It’s a perfect night for riding, and somewhere not too far ahead will be WP2 – with a welcome coffee and a chance to don some warmer layers for the last section to RV1. I must confess that although I have a general recollection of endless stretches of dark gravel road, the details of them are now lost on me. I do recall that it involved some very pleasant sections of farm track as well as district road, but there’s not really much in my memory banks beyond that. 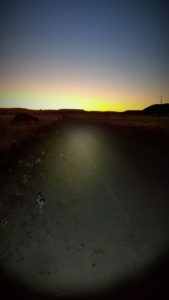 What I remember most is some lively and enjoyable conversation between Pieter, Andrew and myself which foreshortened the apparent distance considerably, and staved off the dozies until, out of the darkness, two blinking lights suddenly appeared either side of the road. At first, we thought we’d overhauled a couple of other riders – the riding had been easy and our pace fast for the last 20km or so. It turned out though to be lights marking the turn off into the waterpoint – they had been set onto the flag poles at the entrance. There’s a roaring fire sat at a distant corner of the lawn – but it seems too far away and instead bodies and bikes are scattered nearer the tables of food and drink. There’s maybe 7 or 8 riders here as Pieter and I pull in, park up, and immediately head for coffee and snacks. Andrew arrives a few minutes later as we’re tucking into boerie rolls – or at least I am, I forget what Pieter had. All three of us dig in our bags for extra layers. Uninterested in any effort needed for modesty, I just disrobe in the middle of the lawn, hastily donning the warm gear before the now chilly night air can worm its way too deep inside. Even so, it takes a second cup of coffee and another boerie roll to get me warm again after changing. 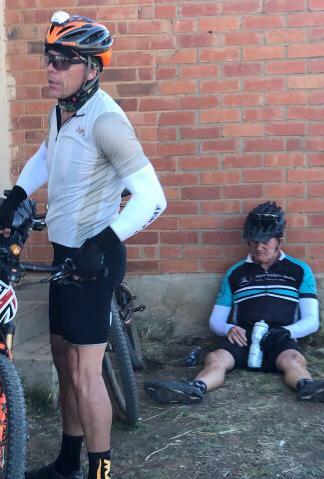 Surprised by my recent improvement in mood and energy, Pieter and Andrew also raid my Advil stocks – although this was a move I would pay for not far down the trail as it re-established them as the stronger riders and my own battle with energy levels takes hold again. Before heading out I joked with one of the ER24 medics that if he wanted a new bike, mine was getting cheaper by the kilometre. 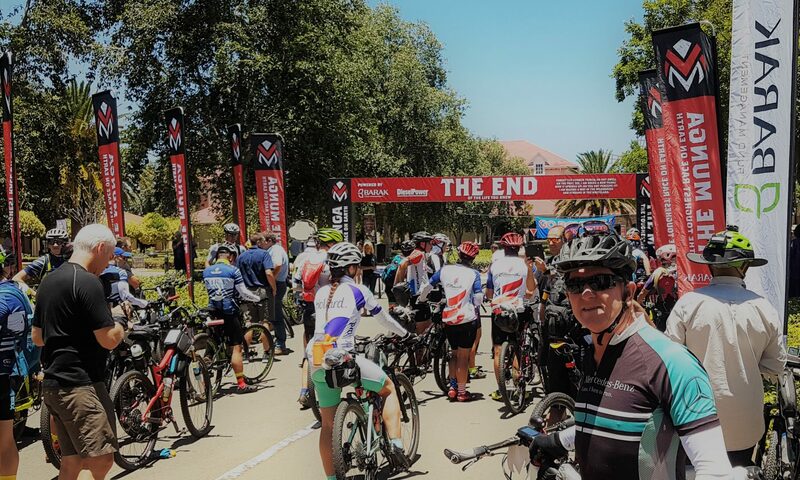 It turned out that one of the two bikes on the back of his bakkie wasn’t a scratched rider but his own – he’d brought it in case a Lanterne Rouge rider might want some riding company. A thoughtful move, and one clearly borne from experience of just what tail end riders battle through at the back of this beast, alone in the night. He mentioned that some way behind us there was a guy already battling and walking some sections. The route so far had been almost flat, so he must be seriously suffering to need to walk so early in the ride. The medic also passed on some highly valuable information about the state of the trail ahead and, in particular, an oil drum sized hole on the right side of the two tracks about 10km further on. He described it as capable of completely swallowing a motorbike, so hitting it at speed on a mountain clearly had potential to be ride ending. I forget whether it was before or after this point that I found my very own hazard. Travelling at speed, my front wheel ploughs into a short patch of soft, deep sand. Unprepared, not yet used to the terrain, and with dulled reactions, I tense up. In an instant my front wheel locks at right angles, and I’m catapulted over the bars, crashing to the ground in an ungainly heap. Luckily Andrew is far enough back to avoid me. Fight or flight instinct kicks in and I’m back up in an instant as a huge rush of adrenalin surges through me. I can feel myself shaking though as I check over myself and the bike.. Aside from some scattered kit, nothing seems broken or even that battered. It’s a surprise to see the SPOT tracker is still firmly in it’s cradle too – maybe not such a dodgy mounting after all. Physically I may be OK, but my nerves are ragged as we ride on. I’m tense all over and gripping way too hard on the bars for many kilometers after the fall. Together with the exertion of pedalling, the wasteful stress energy drains me and it’s not long before the fatigue of earlier is back in full force. Every sand patch has me nervous and jumpy, but I manage to negotiate them without further spills, albeit with a total lack of anything approaching ability or style. The medic hadn’t been lying about the hole – it was flipping enormous, and completely hidden behind a bump in the track. Quite by chance Pieter and I were on the left side anyway, only noticing it as we sail past. Andrew was closer to the middle of the track, and let out a loud ‘Thanks!’ as he heard our warning cries, and made his course correction just in time. Alex had mentioned to watch for Aadvark holes, telling us none were filled in and we would need to deal with nature as we found it. He had not said anything about the size of Aardvark in this part of the Free State though – this one must have been as big as a buffalo to dig a hole that deep. Several times one of us had commented that the wind only really became a problem when the trail swung due South. So it wasn’t much consolation to be staring down a stretch of road leading to the exact point where the derived and imaginary line from the Southern Cross met the horizon. The little N arrow on the eTrex screen was completely superfluous – the stars told us what was important. We were riding directly South, and the riding was punishing. Andrew pulled like a diesel engine against the battering headwind. Pieter managed to keep up but by the time the route turned off right onto farm tracks again, I had dropped some way back, my engine once again stuttering. We’d begun the final, slow, and occasionally technical section of around 35km into RV1. It was a section that was to tax both my abilities and faltering energy levels, and would see the guys waiting with enormous patience for me on several occasions. The promised river beds were there to be ridden, strewn with smooth round boulders and branches lurking in the shadows ready to unseat the careless rider. At one point I became totally confused as to where the trail went. I could see the path of lights that the guys rode, but it took me some moments to unravel the jumble of bushes, rocks and dirt ahead into anything that resembled the arcing track they had followed. Further on the track became faster and flowing, but no less dangerous. I failed to spot a mass of wire across my path and heaved an enormous sigh of relief when it clattered safely under my wheels rather than lodging in a spoke and sending me head first into the dark, rock strewn field alongside. A part of my problem was my light was still on low beam. The transition to it’s brightest setting made a huge difference and I soon caught up to the corner of the field where the guys had stopped for me again. “Slow rocky climb ahead, you guys will be waiting for me at the top”, Andrew announced, recalling it from his attempt the previous year which had ended with a shredded tyre that could not be patched trail side. 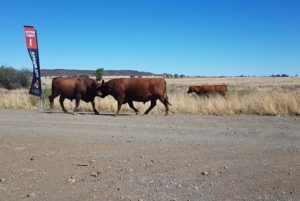 He was right in part – although he omitted the bit about the muddy donga along the way. Pieter sailed through with an effortless display of technical prowess. If he’d seen it in time, I’m sure Andrew would have done the same. But spotting it late, and on an angled approach he ploughed into the ditch, gaining a full mudpack across much of his body in the process. Predictably, I whimped out, dismounted, and trudged through. One of these days I’ll grow a pair, maybe. Andrew was only partially right about the waiting part too. Pieter did beat us to the top by some margin, but the two of us ground, slogged, and picked our way up the rocky trail at much the same pace. 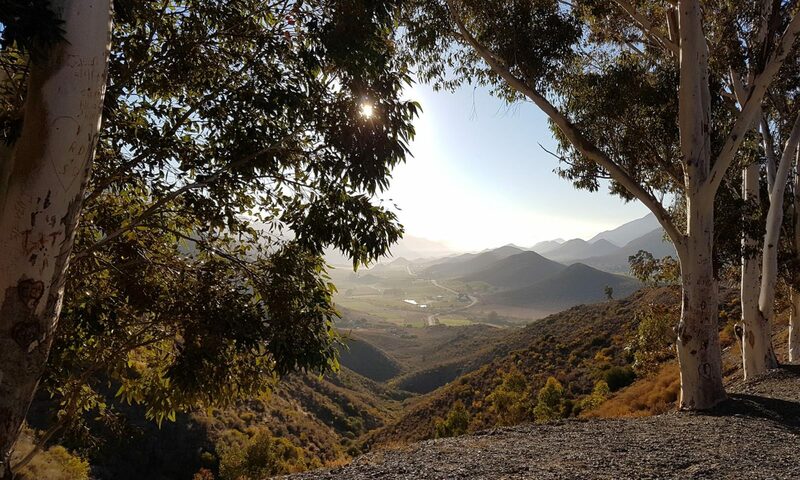 It was some consolation to see the lights of Van der Kloof Dam town in the distance as we rounded the shoulder of the hill we had been climbing. But I knew from reports and studying the route that we were much further away than the illusion created by the beckoning lights. The remaining part of the trail alternated between rocky and sandy as it climbed, and dipped. When finally we did reach the tar road, the left fork took the more direct route, rising sharply upwards onto the dam wall. I remember hearing my breathing puff and blow like an old steam engine as I slogged my way wearily to the top. It would have been nice to stop on the dam, but it was dark, late, and the howling headwind was bitingly cold. I remembered from camping here that we were not done with climbing either, once over the wall another steady haul took us up towards the town itself. At some point the gradient just beat me and I got off and walked, utterly sapped of energy. As the guys waited for me up ahead again, I began to wonder if I’d actually recover enough here to be able to ride on. This had been one of the toughest 220km I’d ever ridden and I felt somewhat dejected and battered by it. “Sorry guys, you really don’t have to wait. I feel bad for holding you back”, I apologised again as we mounted up. “No problem, we said we’d stick together to the RV and we’re almost there” they both replied. Truth was they would have been there at least half an hour earlier but for me, but I was extremely grateful for their companionship and moral support. At last, the road rolled down and we saw more fluttering flags. A marshal stood under the streetlight ushering us right and up a short ramp to a brightly lit cluster of buildings which marked our first Munga RV. The orange sodium glow seemed eerie after the hours of darkness lit only by the circular halos of our bike lights. As we pulled in, both Andrew and I took up the eager mechanics offer of having our bikes lubed, before heading in to get food and sort ourselves out. Thanks so much for sharing your ordeal with us! Bring on the rest, love the reading…. Great stuff – at this rate we can look forward to another installment tomorrow. PS, on mounting the Spot tracker – I’ve also heard the argument that should you get separated from your bike in a crash you’d rather have the tracker on you than on the bike. Hi Rob. Pure delight reading this, seeing that T is my brother!!! Cool – you have a heck of a brother! They build you guys tough. Wow! There’s a lot the dot doesn’t tell you at the time. Loving this! That is definitely true Mike! Rob. You are allowing me to relive every moment. Thank you so much. Can’t wait for the next write up. I laughed out loud re buffelo size aardvark holes…. In my group, I was the one up front in the dark and all I could think of was don’t get caught. You’ll go over and buckle a wheel. I loved and hated them. Then I recall well Andrew telling us about his muddy fall!!! Those moments we chuckled over.